The Tranquility TMW™ Water-to-Water series offers high efficiency and high capacity with advanced features, quiet operation and application flexibility at competitive prices. The TMW series can be used for a variety of hot water applications, the most common being radiant floor heating. Radiant floor heating is the ultimate in comfort and practicality. It reduces fluctuations in temperature, resulting in a more comfortable home environment. The TMW can also provide a large portion of your home's domestic hot water heating needs. A Tranquility TMW Water-to-Water series can be packaged with our Tranquility Forced Air series to provide you with a true, on demand, "triple function" solution for all your home heating, cooling and hot water needs. The efficiencies and capacities of a geothermal system increase dramatically when the functions of both Tranquility systems are combined. As ClimateMaster’s most adaptable R410A refrigerant units, the Tranquility medium temperature Water-to-Water series can be used for radiant floor heating, snow/ice melt, spa and pool water heating, domestic water heating, and many other options. The Tranquility Water to Water offers high efficiency with advanced features, extremely quiet operation, and application flexibility at competitive prices. The series is available in a wide range of unit sizes for most any installation. ► Efficiency saves on your utility bills. ► Even heat distribution may lower heating bills. ► Radiant floor heating proponents claim that fuel savings of 15% to 20% over forced-air systems are possible. ► Radiant floor heating allows for lower water temperatures, which uses less energy and lowers utility bills. ► Water-to-water units can also provide chilled water for distribution to small fan coil units for zoned forced-air cooling. ► With radiant heating, the room heats from the floor bottom up, warming feet and body first and flooring radiates heat for a long period of time. ► The system is “invisible” meaning there are no registers, baseboard units, or radiators to obstruct furniture arrangements, wall décor, and interior design plans. ► Radiant systems may result in less infiltration of outside air into the house compared to houses with forced-air heating. ► Radiant floor heating is ductless and very quiet. Independent zoning gives you more control. Copeland™ high efficiency scroll compressor allows efficient operation. ► Roughly 75-80 percent of heat supplied comes directly from the earth itself, and is clean, free and renewable. ► Compressors are mounted on vibration isolation springs to a heavy gauge mounting plate, which is then isolated from the cabinet base with rubber grommets compressor isolation for ultra quiet operation. ► Fully insulated water and refrigerant lines and compressor section as well as stackable powder coated steel cabinet make it built to last. 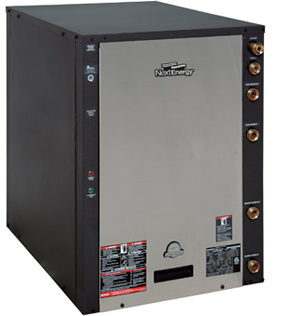 ► Equipment requires smaller installation footprint than a standard boiler installation. ► The unit can be matched to another system for air conditioning, if needed. ► There’s no combustion chamber to maintain and clean. ► There’s no risk of carbon monoxide (CO) poisoning. ► Fewer moving parts provide greater reliability.